Washington DC, Feb 25, GNA - President Nana Addo Dankwa Akufo-Addo on Sunday paid a familiarisation visit to the Washington National Cathedral, as government seeks put up a similar project in Ghana. The President, who is in Washington to participate in and address the Winter Meeting of the National Governors Association (NGA) of the United States of America, was taken round the grounds of the edifice by Randolph Marshall Hollerith, Dean of the Cathedral. Excited and impressed by the Cathedral, the President was hopeful that Ghana would have such facility during his tenure of office. The President cut the sod for the construction of the National Cathedral in Accra March last year. And work on the project, which according to him was a gesture of thanksgivng to the Almighty, is expected to commence soon. He later took part in a non-denominational service in the Cathedral. 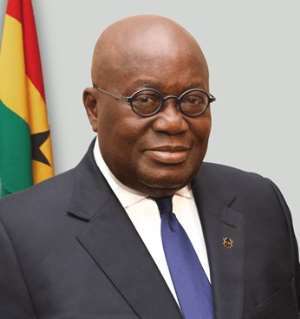 President Akufo-Addo would be the first African leader to address the US Governors forum. President Akufo-Addo would leave the US for Germany on Monday, February 26, 2018 to participate in the Fifth German-African Economic Forum in Dortmund. He is billed to deliver the keynote address at the Forum and would also deliver the main address at the Konrad Adenauer Foundation's German-Ghana Business Forum. He would also hold bilateral talks with the German Chancellor Angela Merkel, to strengthen relations between both nations. The President is expected to return to the US from Germany, where he will take part in the World Leader's Forum Programme, organised by the Amercan-Israel Public Affairs Committee.